Mountain gorillas became known to science in 1902. They have become one of the most iconic endangered species on the planet and a prominent focus for conservation. They were made famous by the book ‘Gorillas in the Mist’ by Dian Fossey and the film based on her book. The mountain gorilla is a sub-species of the eastern lowland gorilla and has shorter arms but longer hair, jaws and teeth. When the males reach adulthood between 12 and 15 years of age, they grow a patch of silver fur on their back and hips and are known as ‘silverbacks’. Males weigh on average 160kg, whilst the females weigh in at around 98kg. Despite the power of a mountain gorilla, they are non-aggressive unless there is a need to protect their family. These shy and intelligent creatures share 98.3% of their DNA with humans and have been seen to exhibit behaviour such as laughter and sadness. These gorillas live in family groups comprising one silverback, who is the leader, three adult females and four to six young. 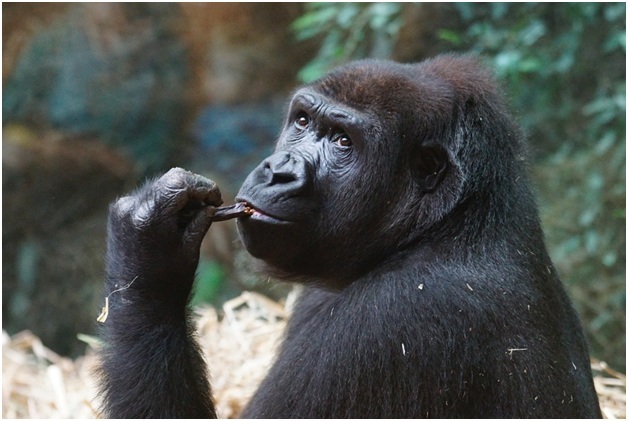 The silverback organises the group activities like eating, nesting in leaves and travelling. Their usual diet is vegetation; they do not require water due to the high moisture content in their food. Females usually give birth at age ten, and the baby travels by clinging to its mother’s back until it is three years old, at which point it is weaned from milk to the adult diet. Mountain gorillas can be found in either the Bwindi impenetrable national park in Uganda or the Virunga volcanoes, which are on the borders of Rwanda, Uganda and the Democratic Republic of Congo. The International Gorilla Conservation Programme is a collaboration of animal-welfare charities and governments to ensure the protection of mountain gorillas. One way they do this is with eco-tourism. In Uganda and Rwanda gorilla trekking is a magical experience that also helps to provide the local people with work. If you would like to go gorilla trekking, always choose a socially and environmentally conscious tour with a company such as steppestravel.co.uk. It’s important to have a carefully guided tour. There is a positive outlook for the future, as numbers have risen from 620 in 1989 to 880 presently, and people are learning to live alongside the gorillas in harmony. « What you need to know to decorate the house with curtains?